Eligible Candidates can Download Rajasthan Board 2017-18 Compartment Result at the Official Website of BSER. 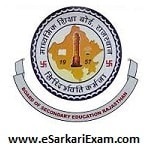 Applicants First Logon to Rajasthan Education Board Official Website. Fill Roll No & Click Submit Button.